^ 1.0 1.1 1.2 Member Countries. World Bank Group. [2016-05-12]. ^ Board of Directors. World Bank. [2011-08-14]. ^ 终结极度贫困促进共享繁荣. 世界银行集团. 2013-04-19 [2013-10-03]. ^ 4.0 4.1 4.2 世界银行：专注帮扶七十年（《非常识》第217期）. 中国网络电视台. 2012-02-29 [2013-10-03]. ^ 6.0 6.1 名词解释：世界银行. 搜狐网. 2008-11-14 [2013-10-03]. ^ Thomas J. Bollyky. How to Fix the World Bank. The New York Times. 2012-04-18 [2013-10-03]. ^ World Bank Group Historical Chronology: 1944-1949. World Bank Group. [2013-10-03]. ^ 9.0 9.1 9.2 9.3 "About Us", wordbank.org, accessed 30 May 2007. ^ Hurlburt, Heather, "Why Jim Yong Kim would make a great World Bank president", The Guardian, 23 Mar 2012. ^ Organization. 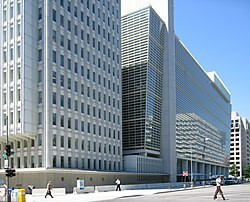 The World Bank Group. [25 March 2009]. ^ Patricia Nell Warren. AIDS and the World Bank: Global Blackmail?. AlterNet. 2000-06-26 [2013-10-03].